Smoothies and juices are great ways of filling your tummy with vitamins, minerals and everything in between. It’s an easy way of making sure you enjoy a mix of fresh fruit and vegetables, whilst enjoying a refreshing drink. There’s nothing I love more than starting the day with a glass of my favorite fruits and veggies. It’s exactly what I need to kick start my day, and never fails to put me in a good mood. How can you feel anything but happy when your insides are full of great foods like strawberries, kale and all of the other amazing foods nature has to offer!? There is a little confusion over the terms ‘smoothies’ and ‘juices’, and a lot of people seem to think the terms are interchangeable. 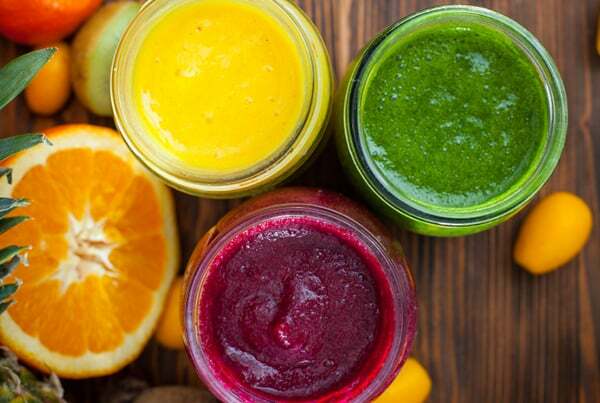 They’re not – smoothies are totally different to juices. They both end up looking like a delicious drink, but trust me when I say they’re not the same thing! Juices are made with juicers, so if you don’t own one of those then it’s safe to assume you’re not juicing. Juicers are nifty machines that separate the fruit pulp from the fruit juice. None of the pulp ends up in your glass. What you’re left with is a delicious fruit juice, made from only the juice and water of the fruit. But you lose the fiber in the fruit and vegetables, this disappears along with the pulp. If you’re using a blender to turn your fruit and veggies into liquid gold, you’re making smoothies. This means you take the whole fruit (well, as much of it as you put in the blender) and simply blend it down. The resulting drink is usually thicker, but contains all of the fiber from the ingredients. Smoothies are more filling than juices, simply because the finished product contains more of the original ingredients. 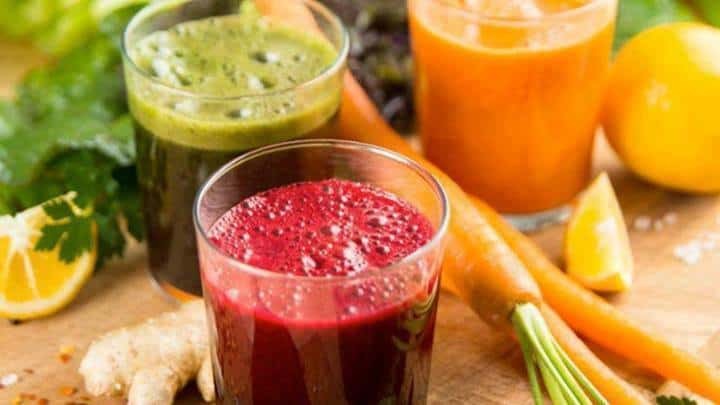 Are smoothies or juices healthier? Hmmm, this is an interesting question and it really depends on what you want to get out of the drink! Smoothies contain all of the fiber, and this means your body has to do a bit of work to get the nutrients out. Juices are fiber-free which means your body doesn’t need to work so hard to draw out the nutrients. That said, fiber is an important part of your diet because it helps to keep your digestive system moving. It’s also important to think about the natural sugars in fruits, and for this reason you should try to limit the amount of fruit included in your juice. The sugars can be difficult for your body to process as well as being pretty bad for your teeth. Vegetable juices taste great though, so don’t worry too much about skimping on the fruit. An easy way to look at it is to think of juices as refreshing, hydrating and intensely, nutrient packed drinks. Smoothies, on the other hand, are more like a meal. When you blend fruit and veggies in a smoothie, everything you stick in the blender ends up in your tummy. This means you get most of the nutrients and benefit from the fullness, unlike with a juice which isn’t really very filling at all – though it’s still packed with nutrients. Which do I like best? Oooh, that’s a tough one! In all honesty, there is a place in my heart for both smoothies and juices. I love how quick and easy it is to create a healthy and nutrient-packed smoothie. I love that they fill me up without making me feel heavy. But, there are also times when I’d rather reach for the juicer. On a hot day, as I’m lying by the pool, nothing quenches my thirst quite like a cool glass of homemade juice. I don’t think I could choose a favorite because I’d keep changing my mind. More importantly, which is your favorite?